Company Name: Fukuoka Shipbuilding Co.,　Ltd.
Fukuoka Shipbuilding Co.,Ltd. is engaged in building ships. 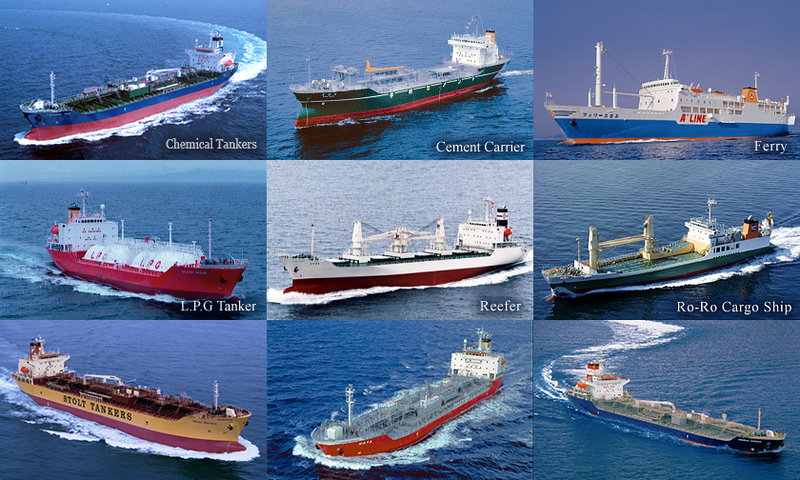 It builds various ships, such as cement carriers, LPG tankers, roll-on and roll-off cargo ships, and refrigerated cargo ships. The company was founded in 1947 and is based in Fukuoka, Japan with additional offices in Nagasaki and Tokyo, Japan. Since Fukuoka Shipbuilding Co., Ltd. established in 1947, a variety of ships, such as a cement carrier, a LPG tanker and a refrigerated cargo ship have been built. Especially, the first chemical tanker (chemical transport ship) has delivered in 1969, building is repeated constantly henceforth, and now it became a Flag Ship of our company. Ship is designed as a bulk carrier so that non-packed cement can be transported efficiently. There are a belt conveyor system, compressed air type automatic cargo handling equipment, etc.,and type of 2,000 to 7,000 dwt. have been built. The abbreviated name of a Roll-on, Roll-off ship. Truck can be rolled on/off, so container, commodities, etc. can be transported functionally and efficiently. Enlargement and improvement in ship speed are also performed and this type of ship plays a part in the distribution system. In order to convey the petroleum gas liquefied by method, such as a normal temperature pressurization type, a normal pressure cooling type, a combined pressurization and cooling type for exclusive use, it is the feature to have a special tank structure of special steel. In order to carry people, vehicles etc. simultaneously, not only a comfortable transportation device but also to support the life of an isolated islands. So, it plays an active part all over the country. It is a fine cargo ship which can conveyed cargoes at high speed, using the cargo hold equipped with refrigeration system and managing a delicate cargoes to temperature/humidity, such as fruits. There are various processes in order to build a huge ship which becomes 6,000t in weight. None can be missed in order to build the ship with the complicated function such as loading cargo, crews live and navigates. A ship is completed efficiently along with the schedule which many people, such as designers with abundant experiences and flexible thinking power and craftsmen who inherited traditional technology. It takes about 2 years to deliver after a design start. Design is divided into a basic design and a detail design. A basic design makes specification with a shipowner from before an order received. Summarizes a request and draws where key plans so that maximum performance can be demonstrated in various restrictions. A detail design subdivides the drawing and information which the basic design summarized and it creates a drawing so that rational production can be performed. Finally, construction starts based on these drawings. Since engineering drawing is reduced and not in full, steel plates cannot be cut based on it. Moreover, the ship consists of curved surfaces, it is necessary to develop it at a plane. The mould is the work which actually makes cutting and the model in which as assembly is possible based on engineering drawing. In the past, the full-scale model was created. But in recent years, cutting data is created using a computer. A ship consists of complicated curved surfaces, so,the work bent is needed since the steel material is plane. It pushes with a pressing machine or the surface is heated with a gas burner, and it bends little by little carefully so that a bending die may be suited. Most is performed by the manual labor by a craftsman which bends a curved surface especially with a smooth shell plate by heating process. It could just be called the work of ‘Superhuman Feat’. Since it is inefficient, building a huge ship at once has adopted the block building method which divides into the blocks and the parts by which NC cutting/bending processing was carried out are welded, and it finishes setting up to a solid block. This process includes into sub-assembly, assembly and grand-assembly. A small block is made at first and going up to a still bigger block combining them. A crane puts a stock of block assembled in the factory on the slipway, and it finishes setting up in the form of a final ship. Since the form of a ship will be distorted if the installation position of a block is out of order, it must set on an exact position, but a block which is big and weight is up to 150t, it needs serious technology and a serious labor work. Painting starts after the erection of a ship finishes. Painting has played the big role also in respect of safe of preventing a hull corrosion not only to improve the appearance of the ship. Furthermore, because of correspondence in an environmental problem, the painting standard is tightened up and it is a process which becomes a very important process. The ship currently assembled/erected ashore by then is floated on the sea for the first time after block installation and painting finish. The slipway leans in the direction of marine like a chute, top slide and float a ship on the sea. Launching is a turning point when building a ship while the staff of a shipyard is becoming tense. Also general people are invited and holds a launching ceremony on a grand scale on that day. After fitting construction, the ship is actually run, the check test of engine performance, such as speed and turning, and it checks having satisfied contract specification between shipowner and the shipyard. A check of operation and functional test are done so that the apparatus simultaneously carried in the ship may demonstrate the planned performance. After finishing an official sea trial, the rest becomes waiting for delivery. A ship leaves a shipyard for the ocean at last. When this day comes around, people of various nationalities in which all the crew are uniform and get busy in the shipyard. If the ship is prepared, it will be a departure. It is seen off by guests such as an owner and the staff of the shipyard and it departs in the world of sea. 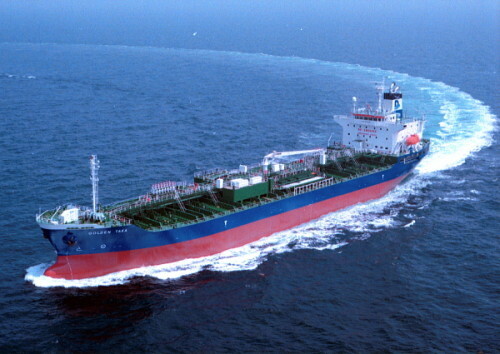 Japan’s Fukuoka Shipbuilding has secured an order worth $118m from Ireland-based Ardmore Shipping to build four 25,000dwt IMO 2 eco-design product and chemical tankers. The Irish shipowner has also negotiated fixed-price options for an unspecified number of additional vessels. Delivery of the four new vessels to Ardmore is scheduled to take place between the fourth quarter of 2014 and the fourth quarter of 2015. The company has exercised options for a total of eight new-build vessels, including the latest contract, since the pricing of its initial public offering (IPO) on 31 July 2013.